i was listening to some stan tracey earlier today, until i put on a show with some bad distortion. so i moved up the alphabet to stan getz and hit paydirt with this show from april 1960, in amsterdam, that ‘frekem’ shared on dime back in oct 2010. stan getz died back in 1991, but his daughter apparently maintains a website – check it out. johansson died in a car accident en route to a concert in 1968, 37 years of age. as a closure of the so-called vara jazz week, “norman granz jatp presents the poll winners” concert packages took place in 1960 in the netherlands, both in the scheveningen kurhaus (set of evening concerts, 9 april) and in the amsterdam concertgebouw (set of after midnight concerts, so 10 april). concerts of peterson/getz/miles (performing in that order) were broadcast live from scheveningen (miles) and from amsterdam (peterson). 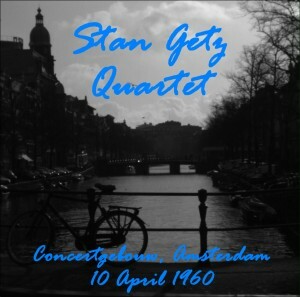 the amsterdam concert of getz was taped to be broadcast on a later date (because at the time there was no permission for live broadcasts after 1 am!). the present tracks are from a re-broadcast i’ve taped some five or so years ago. i kept the opening and closing radio announcements by bassist hans mantel.